Modern equipment: underfloor heating, open wood fireplace, solar panels etc. 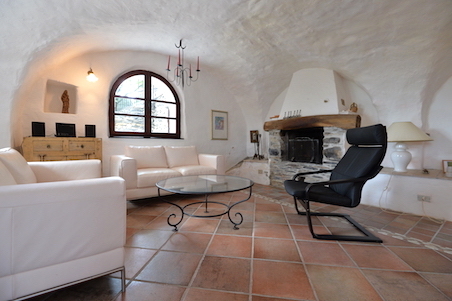 The stone cottage is detached on three sides and offers a living area of approx. 200 sqm gross / 150 sqm net on two levels. Since it was built on the hillside, there are several entrances. On the main entrance level there is a large, bright hall, two bedrooms, a bathroom with a shower cabin of high quality and a large living room. A staircase leads up to the sunny, partly covered roof terrace, offering stunning views of mountains and valleys down to the Mediterranean! Beautiful vaulted ceilings on the lower floor bear witness to bygone times. Here is the spacious living room with open fireplace and large French doors leading to the outdoor area. The living room is right next to the top-quality kitchen with dining area. Next to it, there is a further bedroom and a bathroom with jacuzzi tub. The living room leads to the partially covered, sunny terraces, which are framed by flowerbeds and trees. 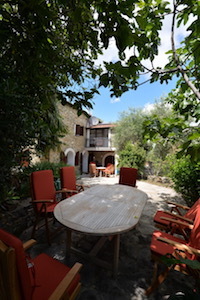 From here some large stairs lead to the garden with citrus fruits, palm trees, oleander, figs and other fruit trees etc. These very well-kept outdoor areas of about 250 sqm offer several seating possibilities and plenty of space to party, barbeque or relax. A small private parking is on the property. On request, an adjacent plot of approximately 300 sqm with 15 olive trees to produce your own oliveoil and the possibility to build a pool, can be purchased additionally. Surrounded by evergreen olive groves, Pantasina is a quiet, picturesque village in the hinterland of Imperia with a grocery store, bar and bus stop. Pantasina, which belongs to the municipality of Vasia, is located about 17 km, less than 30 minutes from Imperia and the coast with its bustling beach life. Nice and Genoa airports are about 120 km away.